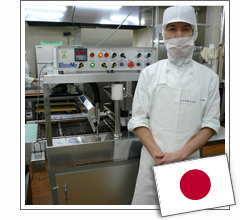 The company Edelweiss is a leading manufacturer in Japan of pastry and high quality chocolate products. Based on high quality raw materials pastry, pralines and truffles are made and sold all over Japan. In year 2006 a cooling tunnel of 10,6 meter was installed and used together with two 2MP40 enrobers in their Tokyo factory. The melting and tempering of the chocolate is done by three 2T130 machines. The entire manufacturing is in the hands of Mr. Ueba.